There are lots of cemeteries out near Palm Springs–Sinatra’s out there, and William Powell–full of past generations, and there are thrift stores, full of those past generations’ stuff. 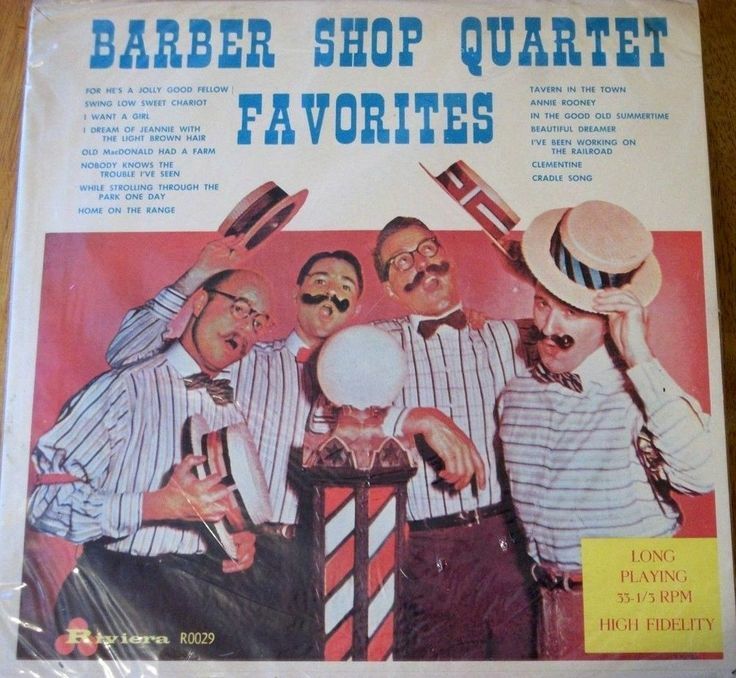 Flip through the record bins and you will find barber shop quartet LP’s by the dozen. Four guys in candy striped shirts with vast mustaches waxed like my neighbor’s Camaro. They stand mouths agape, and there’s a barber pole and a guy in a barber chair swathed in shaving cream, looking disturbed. You will find all kinds of these albums in thrift stores in Palm Springs, every one of which opens with “Bill Bailey”, and finishes with “Sweet Adeline”. I was always terrified of the idea of a barber shaving me while singing Bill Bailey. Syncopation and straight razors never make a great combination. Sweet Adeline would be OK, though. The bins are also full of the greatest generation’s Dixieland records. They made the world safe for democracy, that generation did, and then they listened to Dixieland. Not while saving the world for democracy–Basie and Ellington and the Dorseys and Glenn Miller scored those scenes–but afterward, when they settled down and grew vaguely nostalgic about the music their own fathers listened to. As the originals were all ’78’s few could play them, even by the fifties. So they went out and bought records by the Firehouse Five Plus 2, Turk Murphy and a thousand similar bands across the country. Those records are fun, actually, even a blast, and a lot of the bands are first rate. A little hokey, sometimes, redolent of good times and happy funerals and riverboats slapping the Mississippi into white foam. It was a fairly innocent jazz. The Firehouse Five Plus 2 played Disneyland. They never played in whorehouses or got in knife fights or suffered acute alcoholic psychosis that landed them in the loony bin for the rest of their lives. No, this was all straw hats and banjos and good times. But I like them. My dad loved the stuff. I have a mess of them tucked away in the record cabinet, segregated from the real jazz that my real jazz friends listen to. That way nobody gets embarrassed. And then there were sound effects records that were ideal for early marijuana experimentation, replete with prepared piano dissonance and percussion that would boing from speaker to speaker. Remember those? No? My dad had some, a bunch of them to go with the giant hi-fi console and speakers in the living room. We’d sit in the dark and listen to funny sounds pan from one end of the room to the other. My favorite was the fireworks show. Ten minutes of people listening to fireworks, oohing and ahhing and breaking into applause, big booms and whistles and bangs in the background. Wintry nights in Maine pretending it was 4th of July. There are scores of these records in the bins. Not sure why I never pick any up. They certainly were popular with the exotica crowd a few years ago. They’d put on Tiki shirts like their dads are wearing in the old photographs, and mix long forgotten martinis and listen to Martin Denny records. Somehow these people always thought that I, a jazz fan, was therefore a Martin Denny fan. Funny how wrong people can be. I never made the mistake of thinking the Tiki crowd was nuts about Dixieland, however. Or Cecil Taylor. You can listen to Martin Denny, though. Listen to a lot of those old space age pop records, if only for the jazz players mentioned in Stan Cornyn’s liner notes. With patience, you can hear some terrific soloing. Those records helped an entire generation of musicians who’d once had steady work in swing bands now make the rent. I still catch myself picking up the occasional LP because a favorite jazz player–Buddy Collette, say, or Don Fagerquist–are in the credits. Jazz on the cheap, sort of. Then there is Nelson Eddy and Jeanette McDonald. The gene that made those records listenable seems to have disappeared from the genome. What sounded like real music to our grandparents sounds like torture to us now. Their albums stuff the Palm Springs thrift store bins where they sit forever, unwanted. Let’s just say that Gilbert and Sullivan did not age well for the rock’n’roll generation. It must sound like gas music from Jupiter to the hip hop generation. I hear Nelson Eddy and Jeanette McDonald and I thank god for Bing Crosby and Ella Fitzgerald and the others who saved my people from operetta. This entry was posted in Jazz, Record collecting and tagged Barbershop quartets, dixieland, Eric Dolphy, Exotica, Firehouse Five Plus 2, Jeanette McDonald, Martin Denny, Nelson Eddy, sound effects records. Bookmark the permalink. Great essay. I’d make a tiny comment that Gilbert and Sullivan are superior to the Eddy/McDonald. Catchy melodies and down right hilarious lyrics. Still popular, too; lots of colleges have Gilbert and Sullivan societies.